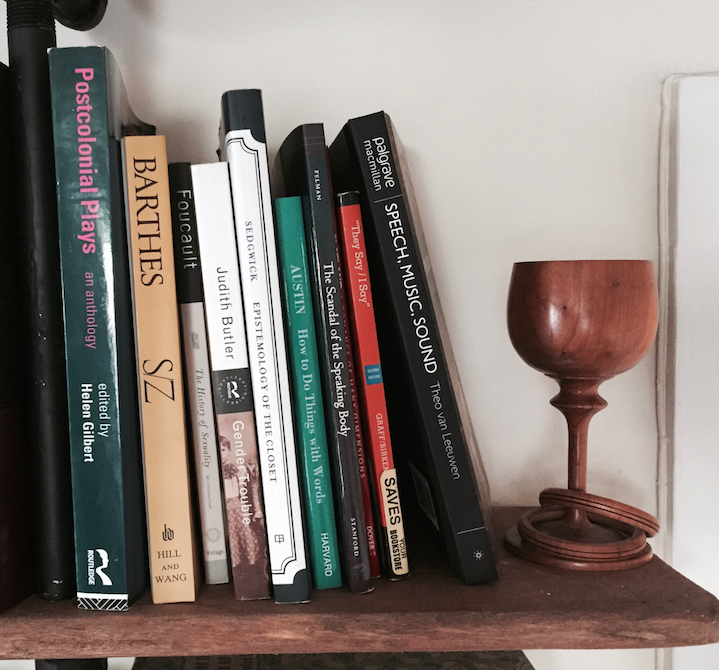 I swiped this idea from my good friend’s blog, Breaking Grad(School), which just featured a super fun shelfie post for World Book Day. I loved it so much that I figured I’d keep the shelfie love coming. 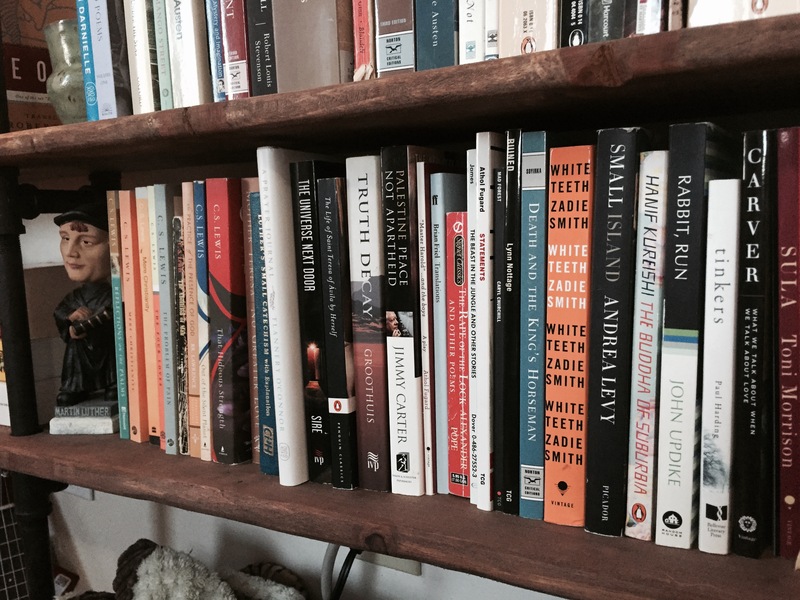 Shelfie: A picture or portrait of your bookshelf. Showcasing literature IN ALL IT’S GLORY! (This term was originally defined by author Rick Riordan). 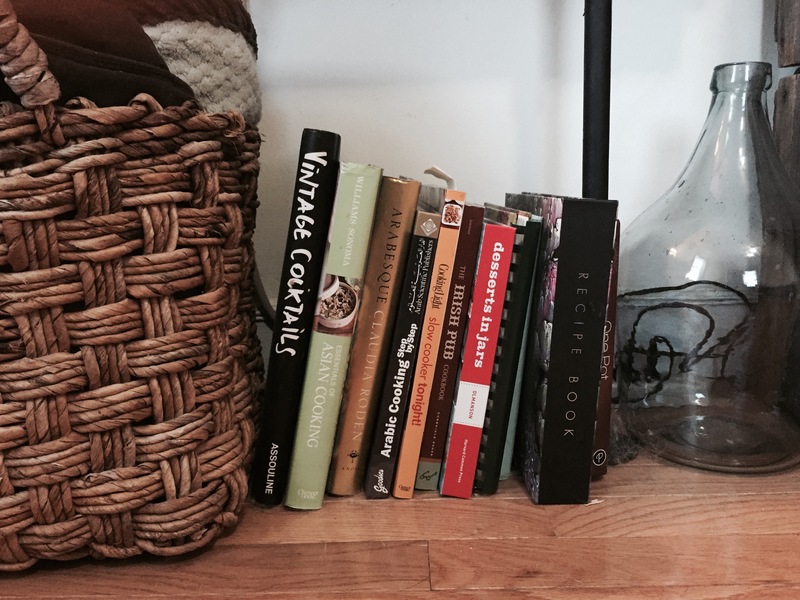 I love this idea for a blog post primarily because my bookshelf is my favorite thing about my apartment. My husband, sister, and sister’s boyfriend built it for me from Home Depot supplies using a series of pictures I found on Pinterest. It was a birthday present and I take every opportunity to share its glory with the world. This is my bookshelf. Guest appearance by my dog. 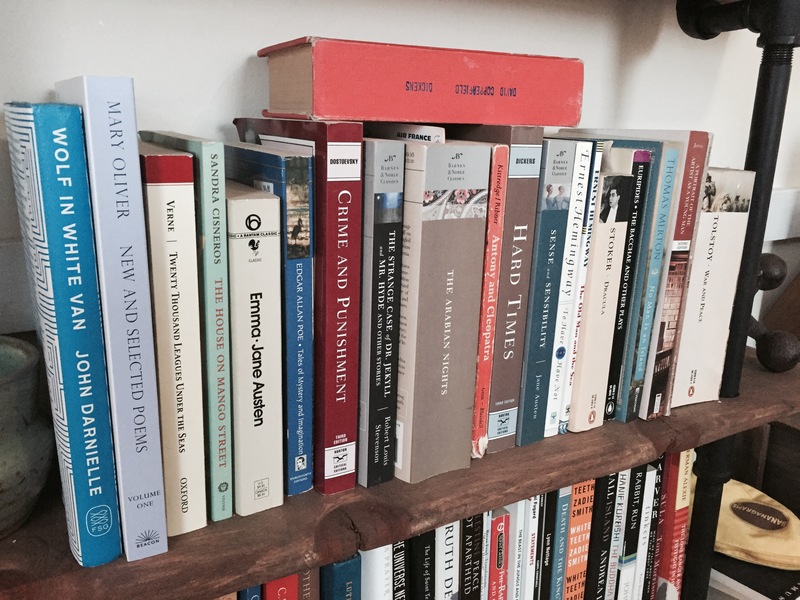 We have my academic and critical theory books by Barthes, Judith Butler, Austin, and Foucault. This isn’t necessarily where I go for beach reading, but these guys are lifesavers when I need them. That carved wooden cup was a wedding gift from a dear friend; her father carved it before passing away and I consider it one of my treasures. 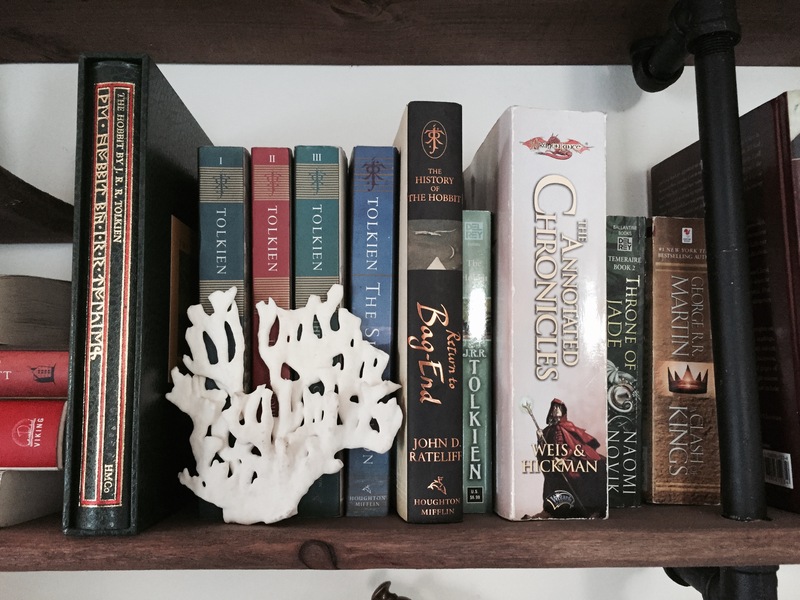 My husband and I have no shame in regards to this shelf of nerd books. We actually have two different shelves of nerd books. These are the books that are presentable enough to be out in our living room. The other shelf is too embarrassingly nerdy to be out in public, so you can only imagine the percentage of dragon/wizard content in the ones we are too ashamed of to have out where they might be seen. There’s a pretty good Tolkien showing here accompanied by some Game of Thrones novels and Margaret Weis and Tracy Hickman, masters of fantasy fiction lore. As for the coral, when I was 7, I spotted it on the bottom of the ocean floor while snorkeling. My mum, in a moment of badassery, free-dove down to the depths of what my 7-year-old mind understood to be at least 200 feet to retrieve it for me. This was when I knew that girls could be just as wild and fearless as boys. 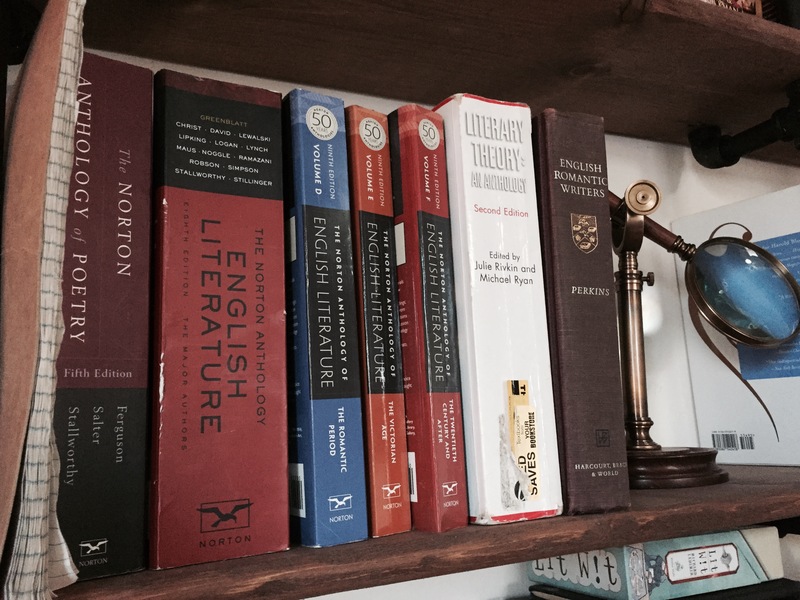 The Nortons and the anthologies. I’m a grad student studying English; this shouldn’t come as a real surprise to anyone. Mostly classics (Jane Austen, Dickens, Bram Stoker, Tolstoy, Dostoyevsky) with a few modern winners in there. Let me take a second to stress how amazing John Darnielle’s Wolf in White Van is. John Darnielle is the lead singer/songwriter for the band, The Mountain Goats, and to say he has a way with words is putting it lightly. I’ll stop here, but only because I can’t imagine you’re still reading this. Also because I believe my dog is chewing on something that I want to keep. Thanks, Breaking Grad(School), for the fun idea. 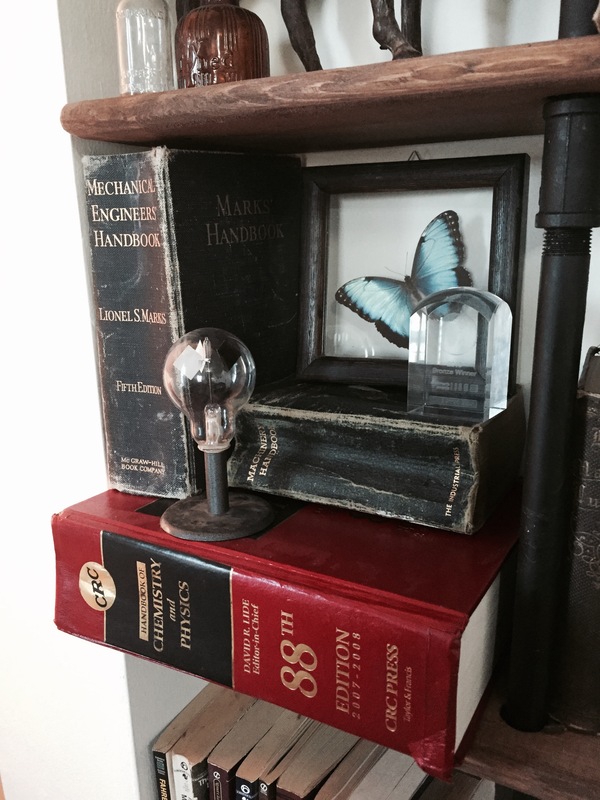 And I hope to see what’s on all of your bookshelves as well! 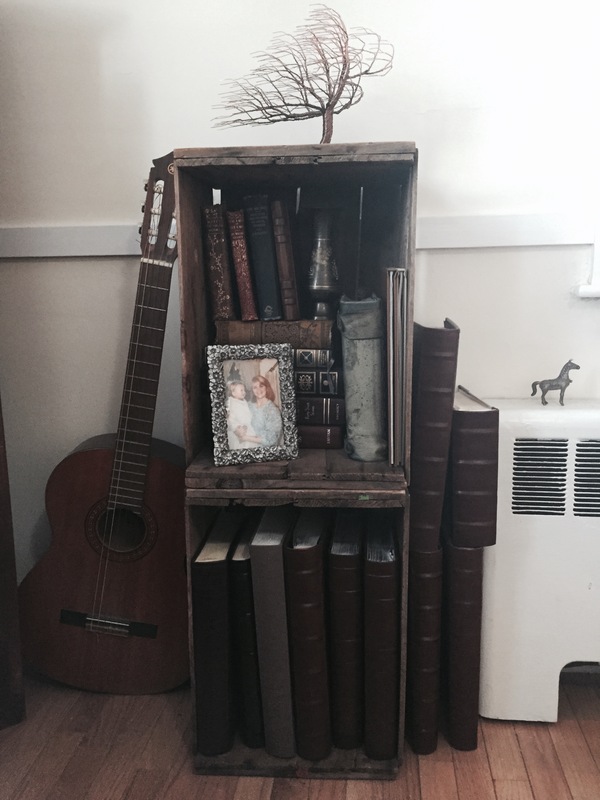 We used these old apple crates at our wedding and now they hold our photo books full of memories and faces we love. Love it! 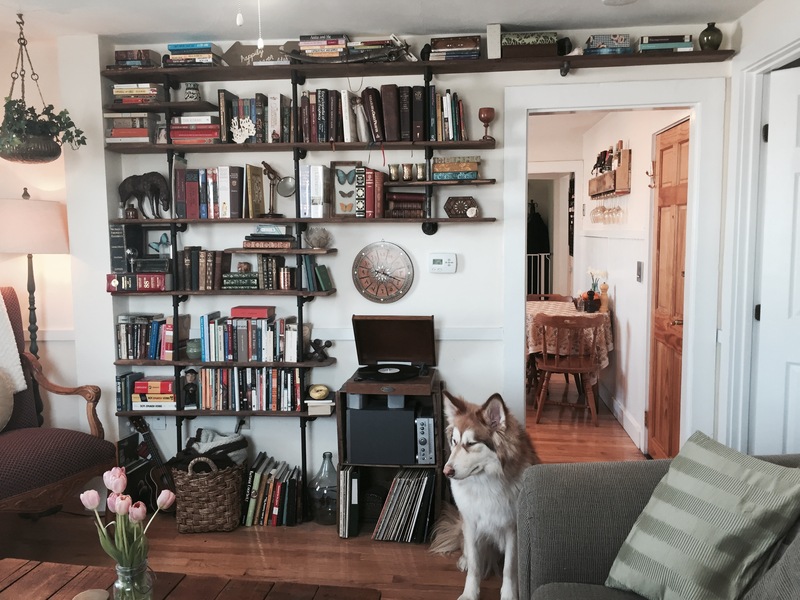 Your shelves, books, and tchotchkes are all gorgeous! 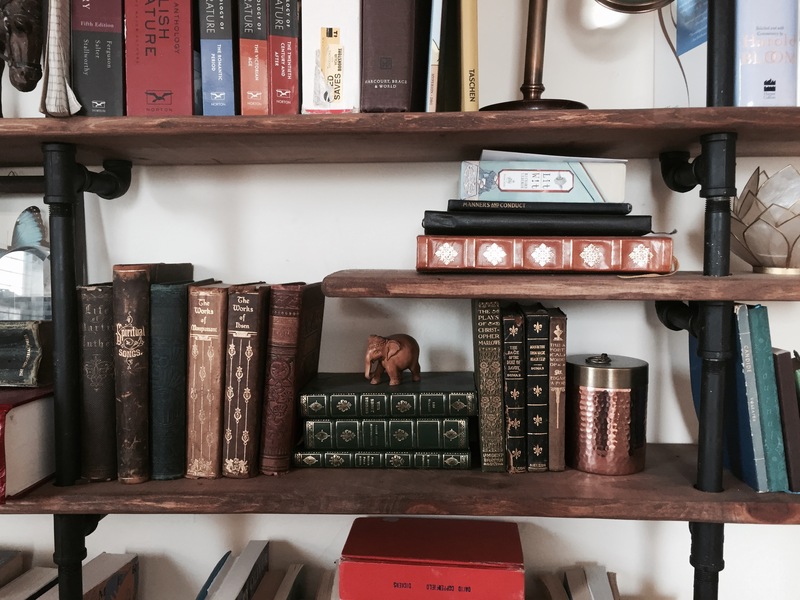 We really need to get a handle on our book situation. We currently have three shelves of varying sizes in two rooms, and we just got another book shelf in a third room which is still empty. I’m particularly impressed with your record player setup. I got a record player for Christmas from my fiance but I still have my records stored in an old printer paper box. I think they deserve better. Thanks for this post. It just gave me like 12 ideas of what I want to do with my living room. haha, why THANK you! The bookshelfing process can be quite the ordeal.